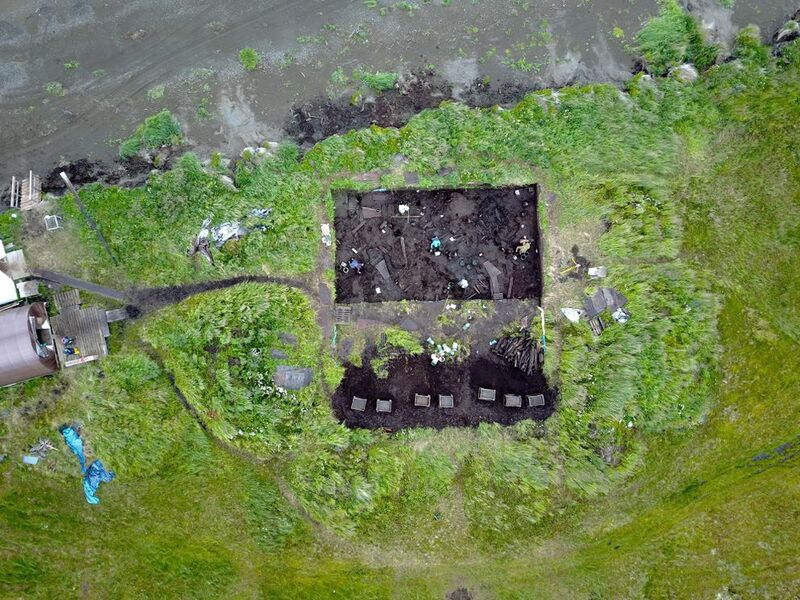 BETHEL — For nearly a decade, archaeological crews from around the world have dug into an ancient site near the Bering Sea village of Quinhagak. This year, they thought they'd wrap it up. Maybe they'd excavate another 12 inches down to reach the bottom of the main dwelling. Then they'd cover and sandbag the site to protect it from eroding away as permafrost thaws. Were they ever glad to be so wrong. "It wasn't just a mop-up," said Rick Knecht, lead archaeologist at the Quinhagak dig, called Nunalleq, or "old village." "The site was about twice as deep as we thought. It had a whole another house underneath." The lower dwelling is even older than the first and holds thousands of objects dating back hundreds of years, including rare, intact masks and figurines, tools and spears, bowls and knives. Many are wooden, preserved by ice that is now melting. So the dig will go on, even as the effort turns to an ambitious, unusual and, for some, nerve-wracking plan to place the collection of archaeological finds right in the village of Quinhagak. The materials are considered the oldest and best-preserved Yup'ik artifacts ever recovered. Tens of thousands of objects now are being stored in Scotland at the University of Aberdeen, where Knecht is a senior lecturer in archaeology. The collection is to be shipped back to Quinhagak next spring for storage, display and research. The large number of well-preserved wooden artifacts is invaluable in recreating the story of an old culture, Knecht said. They show life in a way that fragments of stone and pottery cannot. They also need care. "If anything happens, it's going to be on me and that makes me very nervous," said Warren Jones, chief executive officer of Qanirtuuq Inc., the village corporation that has backed the dig from the start. "I am trying to get everything in place before they come in." The corporation is turning an old preschool building into an archaeological and cultural center in village central. The project is unusual. Some rural communities in Alaska have museums, but nothing like this: a small remote village in a cash-poor region running a research repository for ancient artifacts dating to the time before contact with Russians and other outsiders. Quinhagak, 71 miles southwest of Bethel and a mile from the Bering Sea, is home to fewer than 700 people. It's a fishing village, but for the second summer in a row, commercial fishing is shut down for lack of a processor. 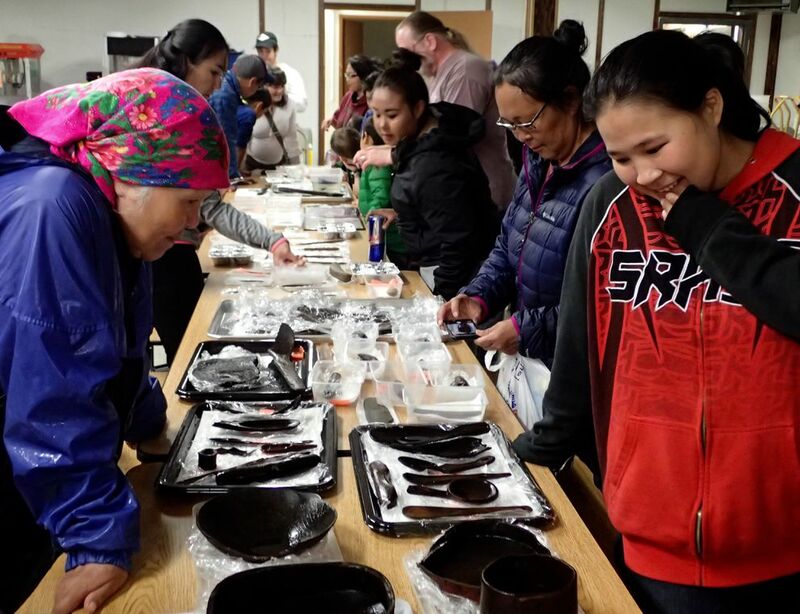 Aaron Leggett, curator of Alaska history and culture at the Anchorage Museum, visited the dig site this summer and was excited at what they are calling Nunalleq Culture and Archaeological Center. "Given what I have seen in the community and the level of support for the project, especially from the village corporation, I do believe it can be done and can be a model," said Leggett, who is Dena'ina. The renovated school building provides "more space and better quality space than we have at University of Aberdeen," Knecht said. Wooden artifacts are preserved through soaking in a chemical solution that replaces water with a binding agent. Then they are slowly dried. Damage occurs from invasion of moisture and rapid changes in temperature, which shouldn't happen in the building, he said. In seven summer seasons of digging, more than 70,000 artifacts have been collected: stone ulus and grass fish baskets, dolls of baleen and wood, bentwood bowls and carved spoons, subtle but stunning masks and jewelry pieces called labrets worn in facial piercings. All of it is coming home. National Geographic did a big story on it this year. A film crew came from Korea in 2014. Articles have appeared in professional journals. Bethel Community Services Foundation, a philanthropic organization, brought a group. Every year, the archaeologists and the community gather for a show-and-tell. Finds from the newly unearthed dwelling haven't yet been dated, but its location indicates it is older than the one above, from the 1600s, Knecht said. Three generations passed through the upper house over some 75 years. The new finds may be from the 1400s, recovering a bigger slice of Yup'ik history for scientists — and locals. "That's the long view of the Little Ice Age that we were looking for," Knecht said. The cooling period extended from the early 14th century to the mid-19th century. Now the warming planet is creating urgency to save what is there. The upper house in the Quinhagak dig was abandoned during the Bow and Arrow Wars between rival groups on the Yukon-Kuskokwim Delta. Fragments of arrows were found stuck in house posts. The dig's artifacts go beyond what is in the Anchorage Museum, Leggett said. "There's nothing like it that's been found in Alaska." Archaeologists and anthropologists are studying the art and functional items. Other scientists are investigating ancient bugs, plants, bird feathers, animal bones and piles of freeze-dried dog poop. "There are whole teams of poo professionals that are taking this stuff apart, looking at proteins and parasites in the dogs," Knecht said. Biosamples will stay in Europe for analysis. Bugs are being used to pinpoint the timing of the attack that led to the house being abandoned. Animal bones eventually will be returned. Across the Yukon-Kuskokwim Delta, permafrost is thawing. Without ice to hold it, soil as fine as bread flour erodes fast. When residents started spotting old items popping out of cliffs on the Bering Sea shore, Jones, the corporation leader, contacted Knecht to see what could be saved. Jones got elders to sign on, even though tradition called for items to be left in the ground. The urgency of the work proved out. The ancient areas dug out in 2009 and 2010 have washed out to sea. Every year, 5 to 30 feet of shore are gobbled up, Jones said. This summer's field work was full of good surprises. Crew members came from Estonia, Sweden, Poland, Malaysia, China, Canada, the Netherlands, the United Kingdom and the United States. Helpers came from the village, including camp manager Mike Smith, Jones' son. "What we had in six years of digging was three complete masks. This year alone we got seven," Knecht said. "They were buried in key places around this house, as if they were buried to protect it in some way." Masks traditionally were broken after being used. Some pieces looked like they were freshly carved though they may be from the era of Joan of Arc in the 15th century. 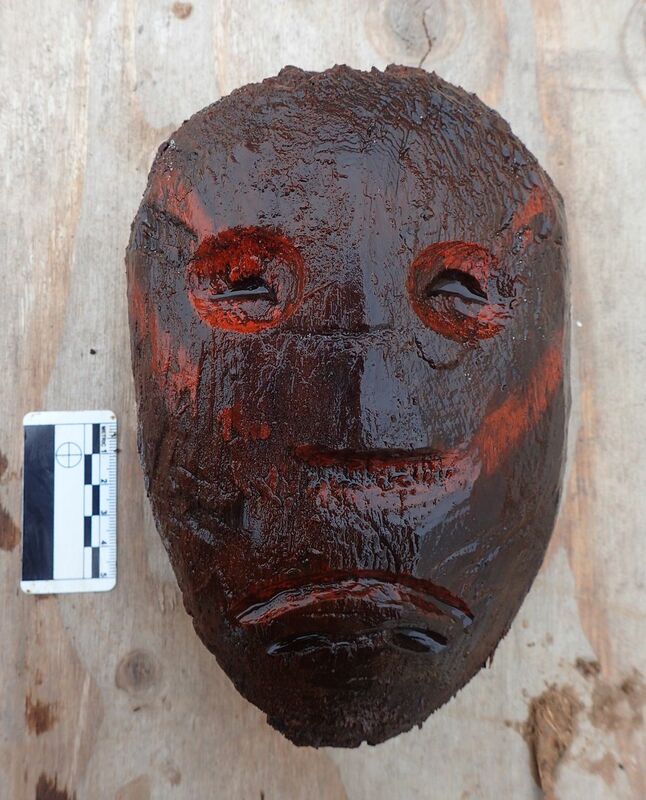 One large wooden face is fierce with marks from the mineral pigment red ocher. It's not a mask and might have been attached to a post for spiritual protection or to ward off enemies, a design never before seen at this site, Knecht said. On the Bering beach one day, he found a dead seal that was fresh enough for locals to eat. He noticed its nose, with nostrils designed to close tight during a dive. Seal masks dug up at the lower house site had slits for nostrils, just like the real seal. The crew remembered that some bowls in the newer, upper house were marked on bottom with the same three simple lines. The crew had puzzled over the marks but finally realized them to be a symbol of a seal. "It's an inherited ownership mark," Knecht said. "The people who identified with the seal really held the cards in that house. … It's like this whole cult of the seal." Almost every coastal village in Alaska has old areas close to the sea that are eroding away, Knecht said. Other villages are contacting Quinhagak looking for help in saving what is theirs, Jones said. If the collection were housed in a bigger city like Anchorage or Fairbanks, it "might as well be on the moon," Knecht said. "Let the 20 or so professionals who are dying to see this stuff come to Quinhagak and see it in context," he said. "Keep the hundreds of people who live here in contact with their own heritage." The village corporation plans to hire local people for round-the-clock security, Jones said. The cultural center should be a draw, said Leggett, of the Anchorage Museum. Quinhagak already attracts sportfishermen. A stop at the cultural center could be a bonus. The target for its opening is May 15, 2018. "What better way to learn about the objects than to be where they were collected among the people who the collections come from," Leggett said. The village changed as a result of the dig, said Smith, the camp manager who first connected with it at age 16 when he was distraught over a breakup. He's 24 now. "This project saved me," he said. Using the ancient finds as inspiration, more people now are carving — including him, he said. They feel connected to their ancestors and culture in ways not possible before the past came out of the ground. Archaeologist Rick Knecht is giving a talk on the Quinhagak dig at noon Monday, Sept. 4, on the Kuskokwim campus of University of Alaska Fairbanks, Room 118. The first 30 people will also get lunch.